Mornings start late and chaotic now that we are a month into our homeschool year. Usually we would have some kind of routine by now but I can honestly say I don’t see a routine on the horizon unless I could somehow triple myself. Thankfully I had already prepped myself mentally for a tough year because that is exactly what I am dealing with. I started off with my list of how to approach the homeschool year fearlessly which I keep going back to in an effort to cling to what I know is most important. Once I get my thoughts out, organized, written and published I have to humbly remind myself to live it out. Since I started blogging each thing I have written about is challenged within days of publishing. Just being real. Little Brave has been attempting to run our home with as much courage as any 2 year old dictator. Why didn’t anyone tell me that discipline would turn out to be as much work as homeschooling if not more? Once these kids start getting the idea of who is in charge and Who their hearts follow, everything flows so much smoother. We are working through this and we will get there. Meanwhile my sanity has been at stake. I am at my best on good nights of sleep and quiet time in the afternoon. Neither one has been an option since the school year started. By the time my poor husband gets home from work I am on my last frazzled nerve. With issues that relate to the hard work of Motherhood I have learned that some of the difficulty has to be waited out. I struggle so much with this part. Sleep can begin to feel so out of reach. Or a meal without a tantrum. Morning time without toddler drama. It is consistency on my part teaching good habits that will help all these issues along. Overnight results would be great, however more out of reach than sleep, Patience is key. So what are some things saving my Homeschool Sanity in the meantime? 100 Devotions for Moms to meet with Jesus. This book has been so perfect for me to start off as I try to make a better habit of getting some focused time with Jesus each day. If I cannot get to it right away in the morning I might grab it in the afternoon with something hot to drink. God has been convicting me lately on my need to rest in order to have a whole life ready to pour out to others, this book reminds me daily of the chances we need to take to press pause in our life! Especially when the air starts cooling down, there is nothing quite like a candle to get me to rest and relax. Woodwick candles are unique because the wick actually mimics the sound a fire crackling while it’s burning. I love that because we don’t have a fireplace! So get me a book, a blanket and a great candle and the sanity starts returning. Yes it’s that time of year! I adore these slippers. Just slipping my feet into them in the morning brings me a sense of calm. When it gets colder out I wear these slippers all day if I’m not leaving our house, they bring added coziness while I jump headfirst into the throes of my homeschool day. Plunder Jewelry is a new discovery to me and I fell in love hard. 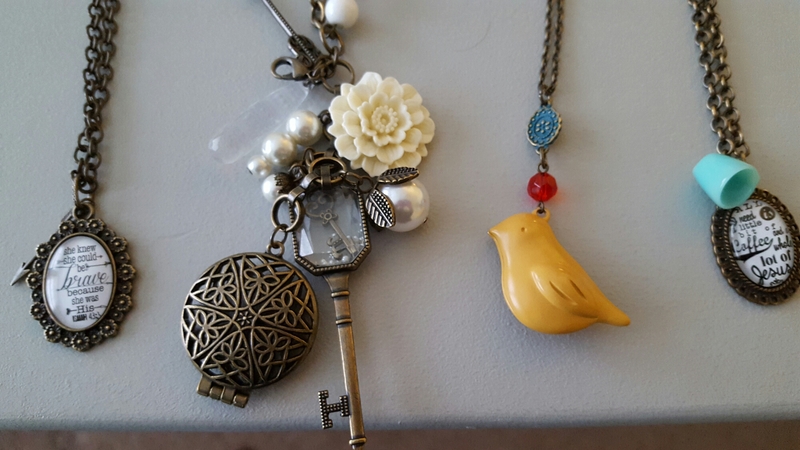 This vintage style jewelry really brings some beauty and encouragement to my day. A few of my necklaces have sayings or scripture that encourage me, you can order some of these beautiful pieces of jewelry with custom quotes or pictures that mean something to you! I am no fashionista but I try to wear at least one accessory every day. It helps me to feel more put together when I look in the mirror and see I made effort to look nice. When I make the effort to look nice, it helps me to actually feel nice and therefore…..saves my sanity. I haven’t been the planner type since I kids, that is until I started missing important dates for things. Showing up at hotels to find out I never make a reservation. Double scheduling our family by accident. Long story short, I am the happy owner of a happy planner. This has turned out to be an amazing sanity saver for me! Now I keep track of everything in one spot, our meal plan, calendar, notes for events, blog ideas! You can get the Home Planner inserts which gives you a place to keep track of To-Do Lists, Budgeting, House Cleaning & Meal Planning. By far my favorite planner! You can jazz it up with fun stickers and washi tape, the possibilities are endless. I have loved Tastefully Simple products for 8 years but only recently became a Consultant. 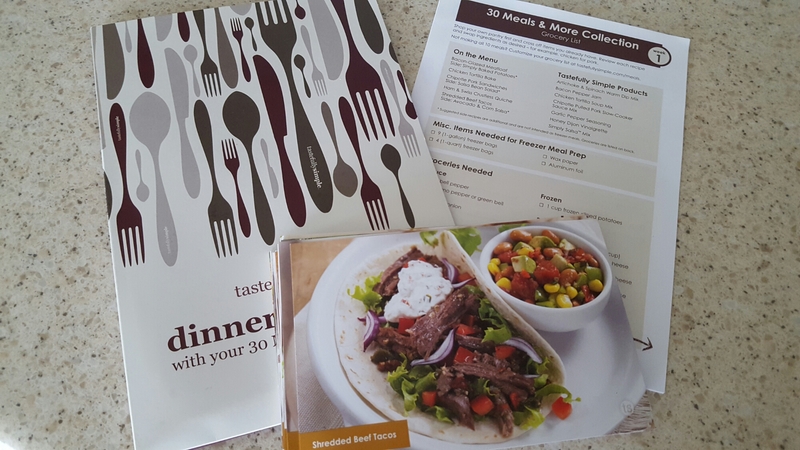 The 30 Meals & More collection has been a game changer for my family and I am excited to share it with other busy families who might struggle to get good meals on the table for dinner each night. This package comes with all the Tastefully Simple products you need to make 30 delicious dinners. The recipes are included along with a meal plan for each week and a list of what you need to get at the grocery store to make your meals. I have always been great at planning meals & understand the importance of us taking time for dinner each night, but it has been a struggle lately for me to get dinner planned out. This has taken the burden off me! Now I have a plan, a shopping list and the meals are quick and simple to prepare each night. My whole family has loved these meals, even my picky eaters! I have a group for Tastefully Simple on Facebook where I am sharing pictures of the meals as I prepare them as well as ideas for using leftovers. The meal collection can even be sent to you automatically if you decide you want to keep using it, then you get 10% to use towards your next purchase and eventually free shipping! We are on that plan because we simply love it too much not to be. If you are interested in the 30 Meals & More collection there is a $40 off coupon I can get you, so contact me & I will get it to you! So those are the things keeping me relatively sane as we muddle through our school year. Just some time with Jesus, a candle, comfy slippers, something pretty to wear, a plan for life and a plan for meals. 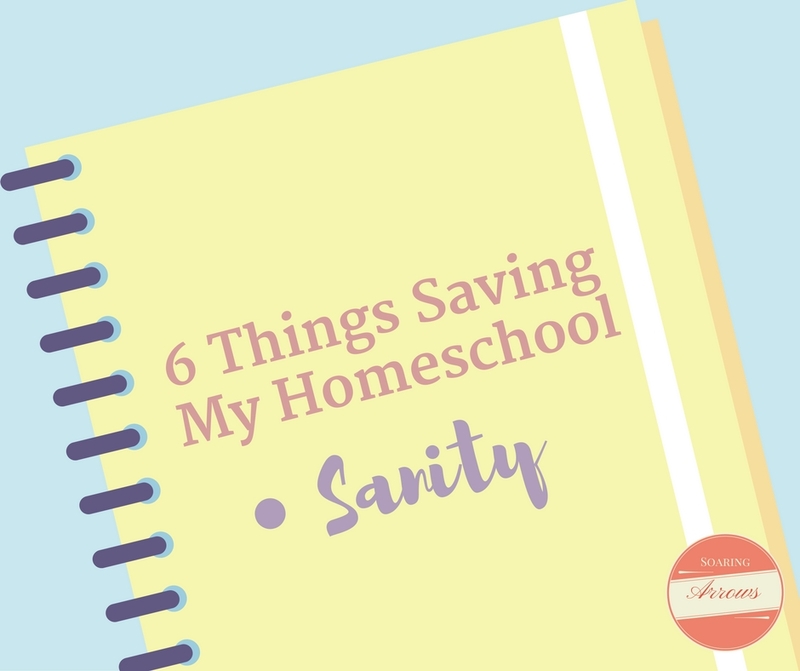 What do you do to save your Homeschool Sanity? What a great list! Little things don’t really change the circumstances, they just add a little extra sparkle to the journey. A happy idea when things are crazy!! Yes exactly! Something to add some relaxation or relief to a crazy day! Love this!! I always love recommendations…. especially food and jewelry 😉 .Your scope had me really thinking about the Tastefully Simple bundle. This just more so. Candles. They are such great sanity savers. Clearing a spot and lighting a fresh candle is so refreshing.